Home Basketball	Surge Wins WBCBL National Champs Quarterfinal, 94-60. 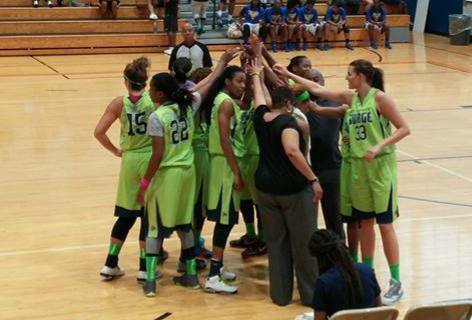 Surge Wins WBCBL National Champs Quarterfinal, 94-60. (GREENVILLE, SC) The St. Louis Surge, defending champions of the Women’s Blue Chip Basketball League (WBCBL), took one step closer to back-to-back titles with a 94-60 victory over the San Antonio Crusaders in the quarterfinal round of the 2015 National Championships Saturday morning at Carolina Academy. The third-seeded Surge (10-1 in the WBCBL and 12-1 overall) plays the winner of the Auburn/Cleveland quarterfinal today at 6 PM Eastern in the semifinals. The winner of that contest advances to Sunday’s 1 PM national trophy game. St. Louis was trailing 16-13 at the end of the first quarter but charged ahead with 27-10 second stanza and possessed a 40-26 halftime lead. The Surge maintained pressure to start the second half and outscored the sixth-seeded Crusaders, 25-12, in the third quarter and sported a 65-38 advantage. St. Louis sealed the quarterfinal victory by outscoring San Antonio in the fourth quarter, 29-22. For updates on tonight’s semifinal game, go to the official Surge Facebook page.